Times of Youth: In brief, enlighten our readers about yourself and your achievements for those who may be unaware. I am an education advocate striving to change the attitudes of people who are against women’s education, despite utmost opposition and threats from many community elders and extremists. I have been risking my life daily to teach young girls. 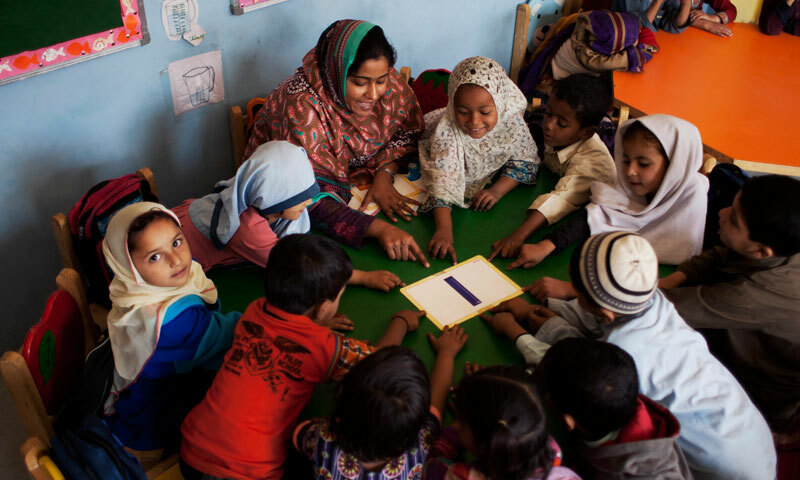 I am the first girl child from my family who acquired education and began championing this right to education in my hometown Muwach Goth, a demoted community in the outskirts of Karachi. At the age of 12, I started classes for impoverished children in my neighborhood, which later grew into the Dream Model School where 1,200 students are currently enrolled. I also founded the Dream Foundation Trust. Recognized by the Women in the World Foundation as one of five “Bravest Women on Earth,” I convene community leaders and elders to challenge biases and archaic thinking about women’s education through conversation. I was awarded the 2013 Women of Impact Award at the 4th Annual Women of the World Foundation’s Summit and my efforts attracted the attention of Chime for Change and Madonna, who pledged to support girls’ education in Pakistan. “Humaira: The Dream Catcher”, a documentary film produced by Sharmeen Obaid Chinoy, captures my voice and brings it to the outside world. Through the work I do in the classrooms and in the community, I am tackling Pakistan’s education problem at every level. Looking forward, I hope to build schools in neighboring communities in addition to inspiring more children, especially girls, to seek education, be empowered, and know their rights so they can defend themselves. I am the Advisory Board Member of Chime for Change, US-PAK Alumni, Asia 21 Young Leaders Class Fellow of 2013, Emerging Leaders of Pakistan class fellow of 2013 and the current featured activist of Sharmeen Obaid-Chinoy’s current film Humaira: The Game Changer, produced by Salma Hayek, Hollywood actress and philanthropist. My work has recently been featured in Time Magazine as well as the CNN. I have received recognition by the CNN correspondent Christiane Amanpour, Oprah Winfrey, US Ambassador-at-large for global women’s issue Catherine Russell and American star and singer Madonna Louise Ciccone. Times of Youth: Your wisdom and courage has inspired several lives in your country today. What inspired you in the first place to go against your father’s wishes to gain knowledge and be who you are today? I believe that education is the only key to unlock entire doors of success. It also gives us ability to judge “what is good and what is bad”. Our society is surrounded by distinct problems such as violence, abuse, corruption, injustice, excesses, patriarchal monarchy, and numerous intolerable acts and I think all of these developed within me the spirit to wage an unrelenting fight against these. I saw around myself, violence against women in the name of tradition and honor, I saw how due to lack of education a mother gives her young child expired medicine which proves fatal for the kid, I saw the ugly face of illiteracy when a pregnant lady in labor pain was administered pain killers not meant for humans. Observing all these things, my young mind could only conclude one thing that this is all an outcome of lack of basic education and awareness. When I was in 6th grade, I decided something has to be done to correct this and that is when we started. I didn’t aim for anything grand, my friends and I just thought that whatever is possible within our limited means we will do. I promised myself that I will make sure that the way my mother had to struggle for my education, the way I had to hide from my father to study, the way my family had to bear insults hurled upon them by community because they were educating their girl, I promised that I will not let that happen to any girl child in my community. Of course, my father was against my education but now, he proudly advises the community to send their daughters to school and supports my vision as well. Times of Youth: In your tender adolescence, you already had the courage to start teaching your community in your own make-shift school and later still at this meager age you already run a well known school. When and how did you aspire to achieve all this? What helped you the most in the long run? When I was 6 year old, I saw my infant cousin die, coughing blood and wheezing for a breath of air – all because her mother was given an expired fever medicine. Medicine the child’s own illiterate mother had fed her because she couldn’t read the expiry date of the medicine. The agony of losing my baby cousin, the heart-wrenching screams of her mother- it was that day when I decided to teach dates to my community. My aspirations gradually amplified and grew my potential for furthering the education system in Pakistan. In this whole journey, my mother played a significant role, my team members always supported me and my students, who had also stood side by side. Times of Youth: What, according to you, is ‘Education’? Education is a basic human right. It is as important as breathing. It can transform the minds and brings peace and sense of better understanding among countries around the world. Times of Youth: Your crusader-like take on education has won you several national and international accolades and attracted media attention world wide, including that of Chime for Change and Madonna. How does that make you feel? I had never imagined I could become well-known and a lot of media coverage would occur, but I think it has been cool and I believe that if you have something better to do and give back to the society for the betterment, such miracles happen instinctively. Obviously these make me feel contented. Times of Youth: Being one of those rare persons to have not one but two documentaries made on by your nation’s coveted Oscar winner Sharmeen Obaid Chinoy, how has this experience been for you and how did it benefit your work? Working in documentaries, especially of Sharmeen Obaid’s has been tremendous experience, and obviously these documentaries put enormous impact on my work and helped make my dream come true in the face of Dream Model Street School. After these documentaries, various international media and donors approached to help my cause which has been the promotion of knowledge, skills and consciousness about education. Times of Youth: As you’re now prominent image of Pakistan’s women education advocate, what are your current endeavours in the field of education? I want to challenge the system of rote learning that is found in government schools in Pakistan. I want to evolve the system of education in Pakistan and bring it to the poor. I, along with my team and well-wishers are working on creating a great education model for Pakistan and will introduce it to the government so that they impart it to their schools so as to give impoverished children the quality education complimentary. In our school, we encourage critical thinking, analysis, learning through discovery, and research, and our teaching methods don’t rely on memorizing information. I want to train others to do the same. Times of Youth: Do you believe education can eliminate crime from the society or it can reduce Crime Rate? Please answer in detail. Of course it can. Look, education teaches us about peace, humanity, love, and respect and if one has understanding about these four essential learnings, he/s will never choose crime. So, obviously people by themselves shall strive to eliminate and diminish crime. Times of Youth: In the wake of how popular you and educationist work has become, do you ever fear what would occur to you at the hands of anti-education minded people, may be even simulate what they had done to Malala? Well, threats have been many. I was threatened by several anti-education minded people as they warned me to stop educating or they would have put me to death and some even attempted to kidnap me but those were my good luck and I would say help from Allah who saved my all the time. One day, the land owner of the premises where we were teaching, threw us and our students outside and locked the main gate of our school and warned us not to even touch the gate. I was very young at that time so we couldn’t do anything. All I could do was to gather children and started teaching them in the street. My mother supported me in those bad situations so we were able to set up classes in my home. Times of Youth: At the end of it all, what is your real goal in life? My first real goal was to build a Model School for my impoverished community which has come true. My current real goal is to build a Peace Park Space, a space that is safe, beautiful, hopeful, and positive, celebrates life and skills, and brings the community together. Purpose of this space is children to play, imagine, discover, and grow. A space which awakens all the senses: sounds, texture, colours, shapes, lines, sweet, sour, savory, aromatic smells. A space that caters to a spectrum of learners: sound, visual, textual, social, independent, logical, concrete and abstract. A space that closes the age gap between parent and child and bridges ethical differences in the community – A conflict resolution and meditation space with rules. A vocational skills development workshop space, yet the space is limited so every inch of it will be usable space including the surface of the walls/pillars/ceilings – wall gardens.  Possible name Peace Park (Bagh Al Sukun), will have written on the exterior wall in such a way that vandalism would not be able to alter it, like carving it into the walls. Functions of the space: Award ceremony, morning assembly, performance space (with a back stage space), vegetable garden, carpentry room, craft workshops, play area with swings and slides, cricket practice space, water well, gardner supplies area, craft or art room, projector, research Gosha (glass-enclosed space) that can be used as a classroom or workshop room, a wall of watering cans, recyclable water, a green space, composting space, sound of water (not trickling but almost gushing), shadows and play of light, kaleidoscope of colors inspired by local crafts, Cool surfaces.  overwhelmingly green space, butterfly garden, a sand box or a mud box that can be sculpted to create land forms for geography classes or for imaginary play or just for messing around. This is a general idea of Peace Park which will also facilitate the entrepreneurs to do their businesses dexterously. The biggest pride I felt is that, when my father came to me and said “Ummi (My father calls me with love), I accept that I have been a greater opposition of your education and this all happened because my brother and my relatives played with my mind but as I see your success and I think I should too work with you to promote your cause”. We both laughed – He hugged me and told me to do whatever I want and even permitted me to get married by my choice. Times of Youth: Despite of being against you at the start, how has your family been handling your success filled journey? At the beginning, my three brothers and my father, they were completely against me and my cause, they thought I was wrong and running to a bad direction. After this long journey, everybody is happy. My eldest brother who said that he would not send his daughter to school now sending his 5 of 5 children to school. Their mind set has been changed and are compelling others. They support me at every stage and are happy. Times of Youth: What is the first thing that comes to your mind when you read the following? Times of Youth: Considering your enormous intellectual potential, we believe that you have the power to bring a rational change in the world. If given an apt chance, what would you do to make this world a better place? If I am given a proper chance to make world a better place, I will make education, health facilities and job opportunities available for everyone. If a person is healthy and has the knowledge of hygienic and unhygienic food, he would hardly ever become ill. Through jobs, people become mentally relaxed because a lot of people have this same issue, earning the bread. If job opportunities are available, poverty reduces, if poverty reduces they become more powerful to think owing to a better living standard. If they have jobs and have the source of earning, they would not choose terrorism. They are criminal because they are poor and it is an easy but dangerous way making turnovers. If these three facilities are on board, nobody will protest, fight, become terrorist, become robber or involve in drastic activities which impair the atmosphere of any country. 5. Try to work for the betterment of your community and for those in need.